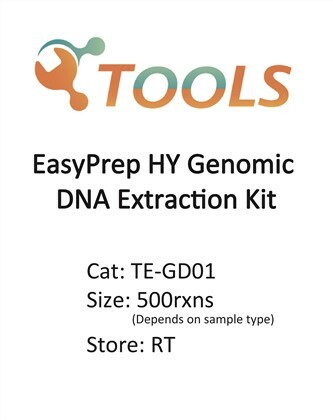 EasyPrep HY Genomic DNA Extraction Kit is based on special buffer system for many kinds of sample’s gDNA extraction. Simple centrifugation processing completely removes contaminants and enzyme inhibitors such as proteins and divalent cations. Purified DNA is rehydrated by DNA Dissolving Buffer, ready for use in downstream applications. DNA purified by EasyPrep HY Genomic DNA Extraction Kit is highly suitable for restriction analysis, PCR analysis, Southern blotting, and cDNA library. 1. Suitable for many types of sample. 2. Low limit of sample volume. 3. High-quality purified DNA can be obtained in 1 hour. 4. The high pure genomic DNA can be used directly in downstream applications.